Info Sander Levin currently serves on the House Ways and Means Committee, which has jurisdiction over all tax, trade and economic growth policies and entitlement spending, including Social Security, Medicare, welfare and unemployment compensation. He is the Ranking Democrat on the Trade Subcommittee. He also serves on the Human Resources subcommittee. He is known as a leader on trade issues - seeking ways to use trade policy to shape globalization. He has persistently challenged unfair trade practices that threaten U.S. manufacturers and U.S. jobs. He also works on a variety of health care issues from children's health care, transitional Medicaid, mental health, managed care reform to updating the Medicare program to include preventative services and prescription drug coverage. Sander Levin was elected to the Michigan State Senate in 1964 where he served on the Education Committee and the Labor Committee. During the 1969-70 session, he was Senate Minority Leader. In 1970 and 1974, Levin was the Democratic candidate for Governor of Michigan. After a four year assignment as Assistant Administrator in the Agency for International Development, he was elected to Congress in 1982. 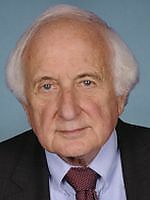 Sander Levin represents Michigan's 12th Congressional District, with its population divided between Oakland and Macomb counties in suburban Detroit. At home he is working to help communities create coalitions to combat drug and alcohol abuse among teenagers. From this experience, Levin co-authored the federal Drug Free Communities Act which has funded over 300 of these programs nationwide. His work on the Anti-Crime bill has resulted in over 70 additional community police officers, a new multi-jurisdictional unit, and $17 million for a consortium of 44 police agencies in Oakland County to upgrade crime-fighting technology at local police departments. Levin is also working to strengthen education and is involved in numerous other local projects. 08/04/2020 MI District 09 - D Primary ?? ?